Nana Life: Reasons To Love Monday, even when its just about over! Reasons To Love Monday, even when its just about over! 1. Pop is on vacation this week so I had scrambled eggs for breakfast. I call it "breakfast at I-Pop". 2. I had a miserable night's sleep and my back is crazy painful today but... I didn't have to do any physical labor beyond washing up the breakfast dishes, which was totally my choice but the least I could do, you know? So even though I'm not feeling ten feet tall and bullet proof, at least I'm not having to try to fake it through eight hours at a desk. 3. Mom and dad have Vacation Bible School this week (he's teaching, she's doing snack, just in case you thought we might have VBS for Seniors around here - we don't, but it's not a bad idea) anyways... since they are both busy, I got to take my daughter in law to class today. Poor thing... I dropped her off and then she found out she didn't have class and she had to wait until I went to the pharmacy and then got back home and Cody was able to get in touch with me since she didn't have my number and... 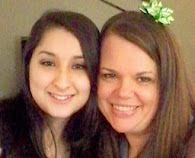 I never answer my phone anyways... and this is a long, run on Reason but the point is that I got to spend some quality time with my daughter in law and that's always a plus. 5. Mama and daddy found two houses in White County that they like. There is a first choice and a second choice. We thought the first choice was already spoken for but it looks like we still have a shot. Both houses have adequate "daughter space" and both have access to a fishin' hole, which is what my mom wants and a good kitchen space which is what my dad wants. I think it's only a coincidence that the first choice is near a Nudist Colony. 6. DISH is the devil. That's not a reason to love Monday but I felt the need to mention it which makes me feel better. As I mentioned previously, they claim the contract I signed allows them to ding my checking account for $130 for early termination of my contract with them. It might have been in the small print but I still dispute the fact that moving renews the contract. I had a two year contract and was with them for nearly four years. DISH math is crooked and of the devil. 7. My brother is officially back on U. S. soil after three weeks in Africa. With him are several others that I hold dear. That's a big reason to love Monday. 8. I can hardly wait to get mama and daddy in White County and be able to introduce them to the nice people at the farm and the bakery and so on and so forth. Clayton County may be where I grew up and raised my babies but White County is home to me. 9. Being here in Clayton County, which I haven't really been since I spent four days in North Carolina with Grandma, but the days that I have been here so far have been pleasant. I did worry about the guy standing on the street corner wearing a leather jacket last week when it was 105 in the shade but I am told that he's harmless... just weird. 10. Pop is making country fried steak, mashed potatoes and gravy for dinner. It's Marquee's favorite and I'd rate it pretty high on my list too. 11.Remember when I mentioned copying photos that were so old that they were tintypes? 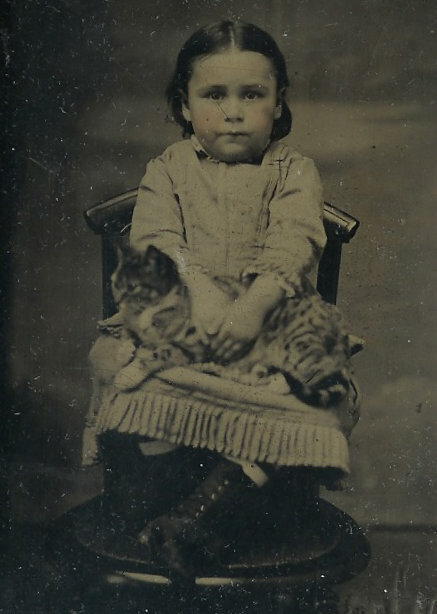 Here's the tintype... it's Kate Green Hall when she was about 3 or 4, some time in the 1870s, I think. She was a first cousin of my great-grandmother. I've looked at this picture a hundred times over the past week and just now realized that she's holding a little tabby cat! Anyways... Happy Monday, y'all! Sounds like things are going well for you. I agree Dish network is evil! I love the tin type.